Yesterday, we shared Antonia Lofaso's recipe for an easy stars and stripes sundae for the 4th of July. This peaches and cream pound cake sundae is perfect for summer because it makes the most of this seasonal fruit. Sweet and juicy summer peaches are soaked in lemon juice, sugar and basil. If you are making this strictly for adults, feel free to add a splash of amaretto or peach liqueur. The fruit is then spooned over a warm piece of buttery pound cake with rich vanilla ice cream. Step 1: Mix peaches, sugar, lemon juice and basil in a small bowl. 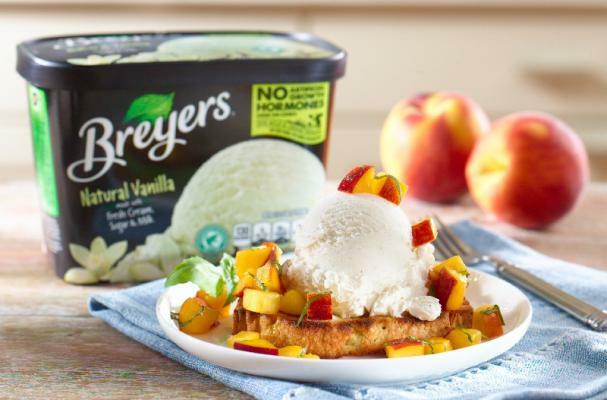 Step 1: To make each sundae, place a slice of toasted pound cake on a plate, then top with a scoop (1/4 cup each scoop) of ice cream and cover generously with macerated peaches.